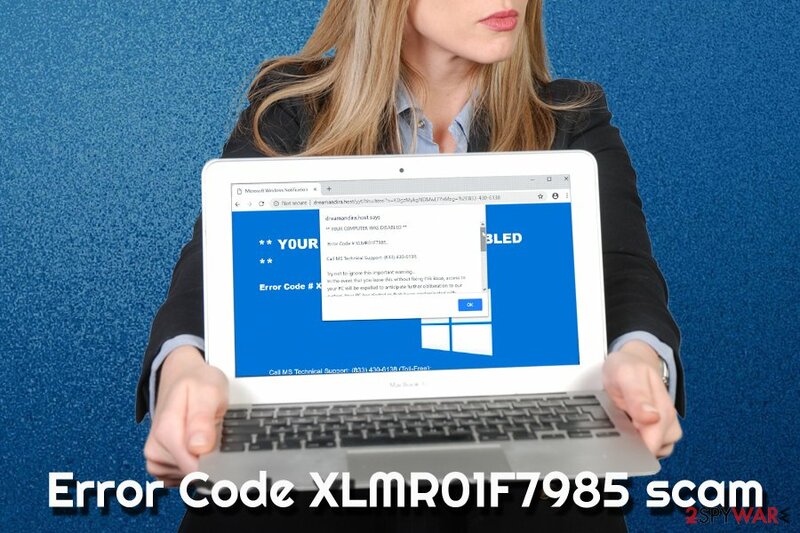 Error Code XLMR01F7985 is a fake pop-up message which claims that the user's PC is infected with malware, and a variety of personal information, including credit card details, are in the danger of disclosure. According to the message, victims need to contact Microsoft tech support in order to resolve the situation and save personal data from compromise. However, Error Code XLMR01F7985 is a scam created by cyber crooks that are trying to swindle money away from users who are less tech-savvy. Those who only encounter redirects to tech-support scams and similar unsafe sites regularly should check their computers for adware infection. Symptoms Intrusive ads, redirects, slower browser operating speed, etc. Affected browsers Google Chrome, Internet Explorer, MS Edge, Mozilla Firefox, Opera, Safari, etc. While adware is not a virus, it is still considered to be unwanted software, merely because it can expose users to certain risks, such as Error Code XLMR01F7985 scam page. The unwanted application usually gets into users' PCs via software bundling or is installed by users intentionally, without them knowing the consequences (adware is often presented as a “useful” application – driver updater, system optimizer, download manager, and similar). However, adware, despite highlighting its useful features, adware rarely discloses the full extent of its operation. Some aggressive adware programs can modify system files, change browser settings or even create scheduled tasks without permission. Therefore, users who do not remove Error Code XLMR01F7985 notifications on time might infect their machines with aggressive adware or even malware. Once infected, users' Google Chrome, Mozilla Firefox, MS Edge, Safari, or another browser, starts redirecting users to questionable sites. 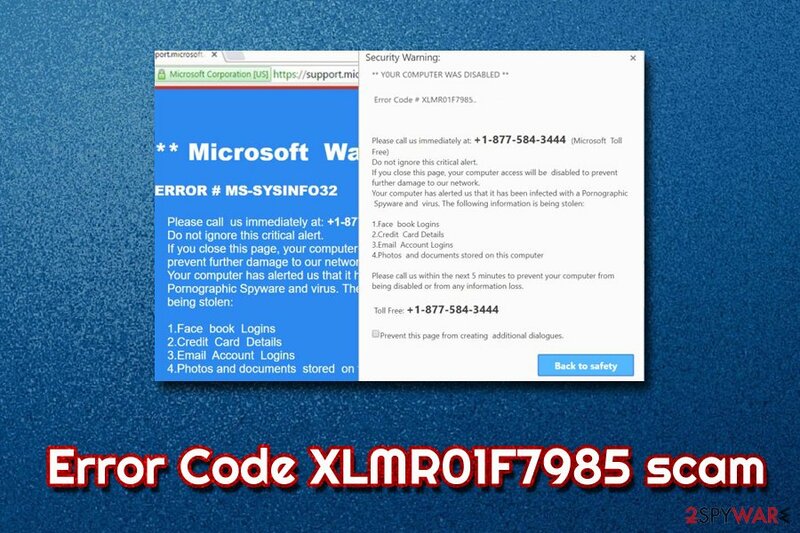 In some cases, users can re-rerouted to Error Code XLMR01F7985 fake alert continually. Nevertheless, there are many similar scams created, such as Microsoft Help Desk Tech Support, Microsoft Warning Alert, and many others, which operate in the same way. As evident, Error Code XLMR01F7985 authors use social engineering to scare users, making them think that their valuable data is at risk of exposure. However, most PC support scams can be recognized quickly due to the nature of the alert itself: Microsoft would never warn about virus infection using a web browser. Additionally, information is either stolen or not, and it cannot be in-between. Nevertheless, many users still fall for Error Code XLMR01F7985 virus scam, and contact criminals the provided number. In most cases, victims are greeted by a person with a foreign accent, claiming that he or she is Microsoft representative and a tech support member. Error Code XLMR01F7985 developers then proceed with talking about severe malware infections, banking account loss, and other non-sensual things. Crooks might ask for permission to remotely control the victim's PC, install data-stealing malware, or ask to purchase some expensive software that is entirely useless. Do not fall for the trick and take care of Error Code XLMR01F7985 removal from your browsers as soon as you can. You can manually search for unwanted programs as per our instructions below, or you can employ security software that specializes in PUP elimination. Additionally, we also suggest you scan your PC with Reimage in order to make sure all the suspicious components are removed. Get rid of all the optional apps by removing the ticks from the pre-ticked boxes. If you are bothered by invasive notifications constantly, you should simply leave the suspicious web page that promotes the scam and remove Error Code XLMR01F7985 related adware. This procedure can be either difficult or easy, depending on your system configuration, and how much negligence the device was exposed to (malware and adware infections often spread quickly, as redirects lead to more infected sites). Error Code XLMR01F7985 removal can be performed with the help of security software or by eliminating unwanted applications manually. You can find the instructions below. Less computer savvy individuals should stick to automatic removal options. Scan your PC with anti-malware software to make sure no dangerous threats are present. Here, look for Error Code XLMR01F7985 or any other recently installed suspicious programs. When in the new window, check Delete personal settings and select Reset again to complete Error Code XLMR01F7985 removal. Once these steps are finished, Error Code XLMR01F7985 should be removed from your Microsoft Edge browser. Here, select Error Code XLMR01F7985 and other questionable plugins. Click Remove to delete these entries. Now you will see Reset Firefox to its default state message with Reset Firefox button. Click this button for several times and complete Error Code XLMR01F7985 removal. Here, select Error Code XLMR01F7985 and other malicious plugins and select trash icon to delete these entries. Click Reset to confirm this action and complete Error Code XLMR01F7985 removal. Here, select Extensions and look for Error Code XLMR01F7985 or other suspicious entries. Click on the Uninstall button to get rid each of them. Now you will see a detailed dialog window filled with reset options. All of those options are usually checked, but you can specify which of them you want to reset. Click the Reset button to complete Error Code XLMR01F7985 removal process. ^ David Harley. Beware tech-support scammers asking to remotely fix your PC. BetaNews. Technology News and Analysis. 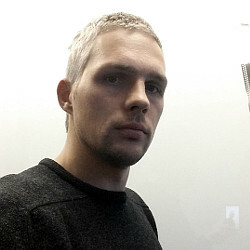 ^ Christian Lueg. Cyber attacks on Android devices on the rise. Gdata. Security Blog. ^ Viruss. Viruss. Cybersecurity researchers. This entry was posted on 2019-01-21 at 08:21 and is filed under Adware, Viruses. You can quickly scan the QR code with your mobile device and have Error Code XLMR01F7985 manual removal instructions right in your pocket. How did you remove Error Code XLMR01F7985?